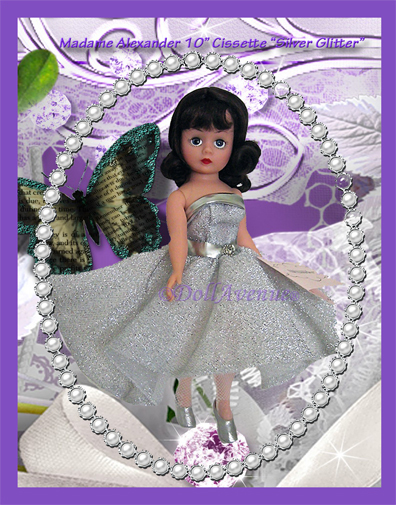 RARE and gorgeous 10" Cissette doll,Â "Silver Glitter"Â is a vision worthy of Ginger Rogers! Cissette's brunette hair is classically styled in a simple flip, which compliments her beautiful rosy complexion and blue eyes. She's ready to dance the night away wearing her glittery silver strapless tea-length knit gown with a wide silver and rhinestone belt that accentuates her tiny waist. Under her dress is a white net slip, shimmery pantyhose, and matching silver satin shoes. Cissette will arrive in excellent condition with all her tags and registration cards. Click on the link below to see a large view of this dancing beauty!